Evamar Fisheries LLC, a seafood distributor, opened up a retail store on Colón Street and Diez de Andino. Amid the economic gloom currently pervading Puerto Rico, one bright spot stands in firm contrast: Loíza Street. This hub of small business activity is once again witnessing a fresh influx of new entrepreneurs who are pumping tens and hundreds of thousands of dollars into the economy to make their dream business a reality. Eyesore buildings left vacant for years are also being renovated in hopes of drawing additional tenants and traffic to the area. New additions, some of which have just opened or will open in coming weeks, are mostly food-related, which should boost the street’s status as San Juan’s restaurant row, giving visitors and tourists more eating choices at affordable prices. They include a Korean Bar-B-Q., a macaroni & cheese outlet, a 50’s diner, a hamburger joint, a café restaurant and an organic bakery. 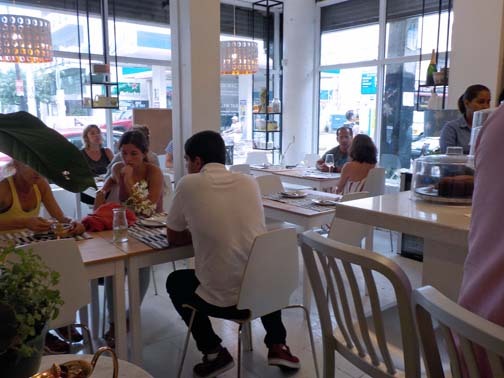 “Loíza Street has turned into a gastronomic hub,” said Ryan Christiansen, president of his eponymous commercial real estate firm, which is active in the area. Business activity on Loíza Street is pretty much concentrated along the first mile and a half of the corridor, which begins at the corner of De Diego Avenue and ends in Isla Verde. The periphery is likewise drawing new tenants. Evamar Fisheries LLC, a seafood distributor, opened up a retail store on Colón Street and Diez de Andino, a block off Loíza St, out of which it sells to restaurants and the public. Entrepreneurs are filling up vacant spaces, replacing businesses that moved elsewhere or folded, and creating around 60 full-time and part-time jobs. In the process, they are injecting tens and hundreds of thousands of dollars into the Puerto Rico economy. Based on interviews, the value of investments between April and June is close to $700,000, mostly self-funded money. The single biggest is Evamar at around $280,000. That’s not counting other recent investments, like the nearly $600,000 that went into the recent renovation of a large commercial building on the corner of Taft and Loíza. Christiansen Commercial Real Estate, which represents the owners, hopes to attract a restaurant on the first floor and office tenants on the upper two stories. 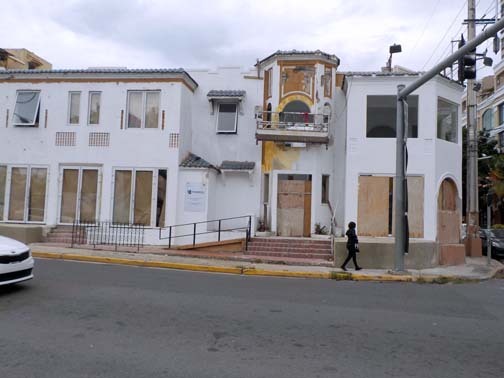 Another property currently under renovation is a building at the entrance to Loíza St., corner of De Diego Ave.
A big eyesore for many years, the two-story structure now sports a fresh coat of white paint while work continues on both exterior and interior. A sign outside the building references the glass windows, which were installed by Storm King Windows, a Ciales-based company. Mac’n Cheese is a cheerful outlet painted bright orange and yellow that opened last week and serves up variations on the popular pasta dish. “It’s either now or never,” said Tanama Besosa, a former editor at Allure magazine in New York City. She acknowledged that plunking $15,000 to open T, a small boutique devoted to beach fashions and accessories, is a risk but one she felt it was time to take. Besosa’s comment reflects the spirit of pluckiness and resourcefulness found among this latest wave of entrepreneurs. They bring with them experience working in similar other businesses or allied skills they hope will serve them well in their new endeavor. The state of the economy is a concern, of course, but they nonetheless feel confident they have something unique to offer consumers and the passion to back it up. Maritere (Ary) Gonzalez, who teamed up with her building contractor husband, Miguel Angel Maldonado, to offer two novel food concepts, said going out to bars and restaurants is a form of entertainment in Puerto Rico. “We have no Disney World. People go out to eat and drink,” said the mother of three sons who turned a favorite macaroni and cheese family recipe into the basis for Mac’n Cheese, a cheerful outlet painted bright orange and yellow that opened last week and serves up variations on the popular pasta dish. All dishes are made daily, using fresh ingredients, she said. Next door is her husband’s restaurant, Han Gang Korean Barb-B-Q, named after one of the major rivers in South Korea. It occupies an ample space that, over the past year, Maldonado has turned into a striking setting featuring handmade tables outfitted with individual gas-powered burners imported from Korea and draft vents hanging from the ceiling like colorful, sculptural decorations. The opening date is mid-June. The two restaurants represent an investment of $150,000, Gonzalez said. “Loíza Street has a big future,” said Yadiel Berrios. This long-time area businessman is plunking $30,000 to open Fillie’s in the space formerly occupied by another one of his enterprises, El Rex, now operating across from Gallery Plaza. The investment could have been higher but he’s putting in a lot of the work himself, cutting down on expenses. 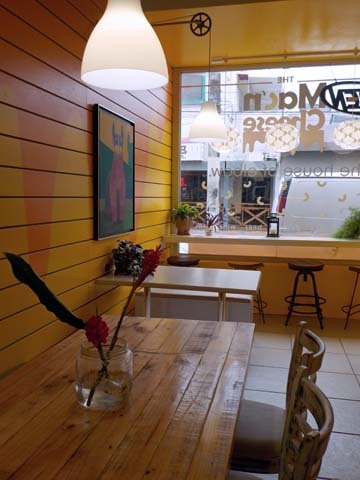 Fillie’s takes inspiration from a family business, On D Way Burger House in Trujillo Alto that had a successful seven-year run before closing five years ago. The menu will feature hamburgers, tacos, chicken wings and snacks. Emmanuel Diaz-Candelario, the young man behind the soon-to-open Dude’s Diner, ran La Jamberguera in Hato Rey for six years and also a food truck before deciding to turn his passion for the 50s and 60s into a family style diner. Steeped in nostalgia, the diner is a bright, colorful space that comes with a penny arcade for the kids and a soda fountain for young and old. Diaz said he had no preference for Loíza Street but chose to locate there because he got a good offer on the rentand felt confident he had a competitive concept. “There is nothing like what I am offering,” he said. His $70,000 investment combines his own funds and bank financing. Naisha Rodríguez finds that people have gotten tired of big box shopping and are ready for the personalized service that she and her business partner, attorney Ingrid Colberg, want to provide at their soon-to-open Mad Love boutique, across from The Locals. Next door is another newcomer to the street: her mother, Carmen Vega. Rodriguez, 36, recently relocated from New York where she worked in the fashion industry. In New York, she said, “there is work and you make a big salary but you have no life. “The only thing you do is work, work, work,” she said. In need of a lifestyle change and unhappy with the aggressive climate ensuing Donald Trump’s presidential win, Rodríguez returned to Puerto Rico in a move that coincided with her mother’s plan to relocate Fairy Cakes, the baked goods business she opened in Hato Rey four years ago. Fairy Cakes, according to Carmen Vega, caters to people “who want to eat better” and are seeking vegan and gluten alternatives. She chose to relocate, at an investment of $25,000, to tap the tourist market and walking traffic. Besides, she loves Loíza St. Finders Keepers just opened a café restaurant on its premises at an investment of $50,000. There is no denying newcomers and long-timers on the street face challenges. The Puerto Rico economy is now in its 12th year of recession and the government is about to institute draconian austerity measures as part of a plan to tackle its debt crisis. The island’s finances are currently being overseen by a U.S. Congress-mandated Financial Oversight and Management Board. 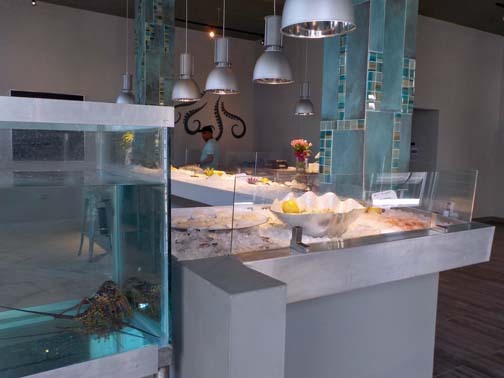 That’s one reason Evamar chose to set up its retail operation, Pescaderia Evamar (Evamar Fish Market) in a 2,000-square-foot building one block off from Loíza St. It came with an unbeatable selling point: a big parking lot next door. The store opened a few weeks ago and owner Eva Silva Rodriguez said she is flying in seafood from all parts of the world within 24 to 30 hours of fish being caught. It took about five years of traveling to different countries to develop the far-flung sources she relies upon to obtain the freshest and best quality seafood, 95 percent of which comes in fresh as opposed to frozen, she said. Elaine Saldaña, who teamed with her sister Mirti to open Finders Keepers, a consignment store, a year ago, says inadequate parking keeps many people from coming to Loíza St., which is why she would like to see the city government repurpose nearby empty lots as parking spaces. Meanwhile, the store is managing to sell its extensive inventory of consumer goods but at a slow pace. To boost its clientele, Finders Keepers just opened a café restaurant on its premises at an investment of $50,000. It is named after the young chef in charge of the operation: Paulina Escanes. The restaurant is small but cozy, with elegantly appointed square tables arranged around the attractive open kitchen featuring white cabinetry and a stainless steel Wolf stove. “We want people to feel as if they are eating at a friend’s home,” said Escanes. According to Chantal Benet, an economist at Inteligencia Economica, Loíza St. is a good example of the growth the small business sector is experiencing at this time. Small businesses account for 90 percent of the jobs in Puerto Rico’s private sector. “I think that now more than ever, the private sector is going to have to pick up the reins of the [island] to move it forward. The government needs to help small and medium-sized businesses and make their work easier so they can invest, create jobs, maintain capital and balance the cuts the government will be imposing,” Benet said. I moved to this area recognizing what is the beginning to a wonderful future. It’ll be continuing to contribute for a long time ! eXTREMADAMENTE ESPERANZADOR Y DIGNO DE EMULARSE EN OTROS SITIOS EN PR. ADELANTE! hasta que los arrendatarios decidan subir el precio de renta, y entonces paralizan el crecimiento. Hey Buddy!, I found this information for you: "Loíza St. bustling with new small business activity". Here is the website link: https://newsismybusiness.com/bustling-business-activity/. Thank you.